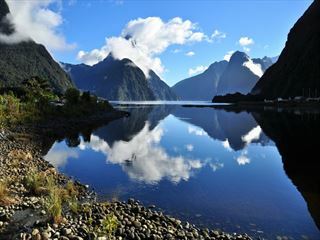 An utterly spectacular land of magnificent national parks, rich Maori culture and world-class scenery of towering mountain peaks, pristine fiords and lakes, sublime forests, stunning beaches, and vibrant cities, New Zealand can be as tame or adrenaline-fuelled as you wish, but it will always be incredible. 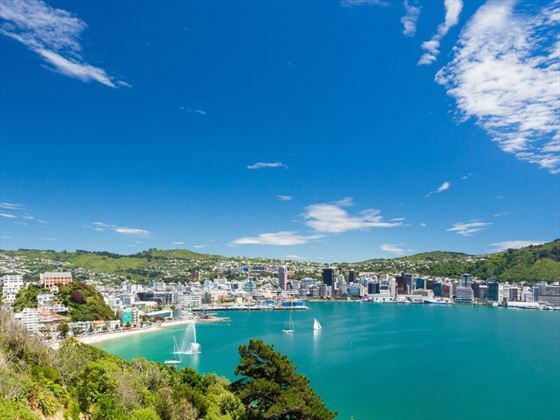 Starting in the gorgeous North Island region of Auckland and ending in the South Island’s beautiful city of Christchurch, this unforgettable adventure will immerse you in the nation’s greatest attractions, fascinating culture, fabulous cities and breath-taking scenery over 21 days. Throughout the tour, there are many two-night stays so you can fully discover the hidden gems and iconic sights of each destination, and after each day of exploring, you’ll retreat to our hand-picked selection of charming, boutique hotels and lodges. * Some of the activities listed below are optional, you may customise your itinerary to your preferences and add activities to suit your personal interests. Give our travel experts a call to start planning your adventure of a lifetime. Upon arrival in New Zealand, a representative will hand you a detailed tour pack with all the information you will need throughout your adventure. 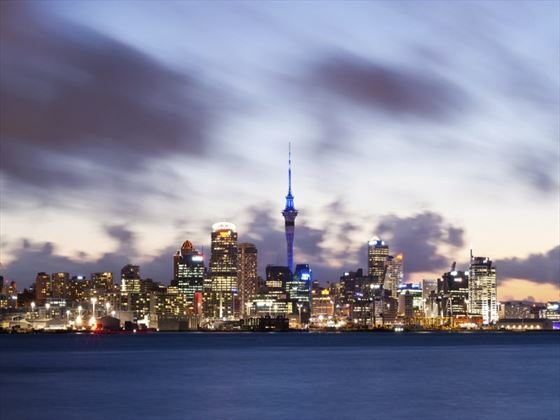 From the airport, you will be privately transferred to your hotel in Auckland. The rest of the day is at leisure to explore this vibrant, picturesque city. You will enjoy a second day at leisure in the ‘City of Sails’ and its incredible natural surroundings. With a thriving urban culture, this cosmopolitan city has an endless selection of activities both indoors and outdoors. You may wish to explore the fabulous nature surrounding Auckland, from the rainforest and beaches of Waitakere Ranges, Te Henga-Bethells’ vast black beach or Muriwai Beach, home to the world’s only mainland breeding colonies of the Australasian Gannett. 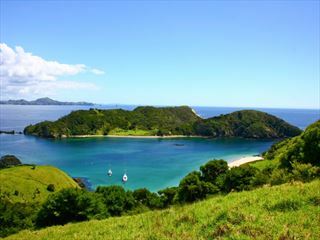 West Auckland is also home to some of the nation’s oldest wineries around the Kumeu and Waimaku regions, and Waihehe Island is the place to go for spectacular beaches, boutique vineyards and spectacular gourmet food and wine. A drive south of Auckland will take you past the Bombay Hills and into the rolling farmland and rich dairy pastures of the Waikato. Turn inland to central Waikato, and you’ll soon arrive in the town of Matamata where you can visit the fully intact Hobbiton film set used in the shooting of the Lord of the Rings and The Hobbit trilogies. Continuing on, you’ll pass several small farming communities before the signs of steam and other geothermal activity signal your arrival into Rotorua. Overflowing with natural hot springs, boiling mud pools and steaming geysers, Rotorua sits within one of the world’s most active volcanic regions. However, geothermal landmarks aside, the city of sulphur has a rich indigenous history; home to several Maori tribes, a visit to the Mitai Maori Village should be high on your agenda. There’s a plethora of exhilarating activities to enjoy in Rotorua, including a helicopter tour around White Island, New Zealand’s most active volcano, or some of the adrenaline-fuelled attractions at Agroventures including static skydiving or a giant swing reaching 130km/hour. Head up on the Gondola for soaring lake views, and ride the luge at night for an extra thrill. 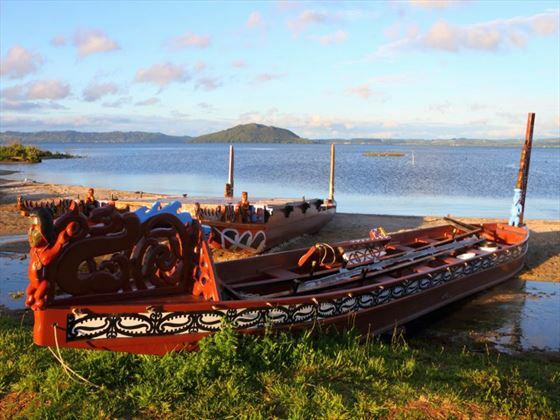 Make the most of your time in Rotorua with an excursion through the famous Wai-O-Tapu Thermal Wonderland, one of the area’s most colourful volcanic attractions, or if you’re a Lord of the Rings / The Hobbit fan, a drive to the nearby Matamata will definitely be worth your while to experience the actual movie set. 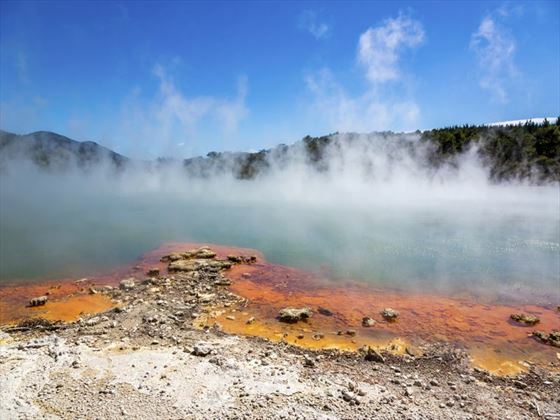 This incredible drive will take you through the thermal region just south of Rotorua – notable attractions to see here are Wai-O-Tapu, Waimangu and Craters of the Moon. Continue onto Taupo and marvel at the lake, a giant crater formed following a volcanic eruption in the year 180 CE. As you approach the city, be sure to stop at Huka Falls to view the spectacular sight of hundreds of cubic metres of water spilling every second down the 11-metre drop. For an extra thrill, take a jet-boat ride to the base of the falls. Leaving Taupo, follow the road as it climbs the rugged Ahimanawa Range before descending back down the Pacific Coast to the art deco city of Napier. 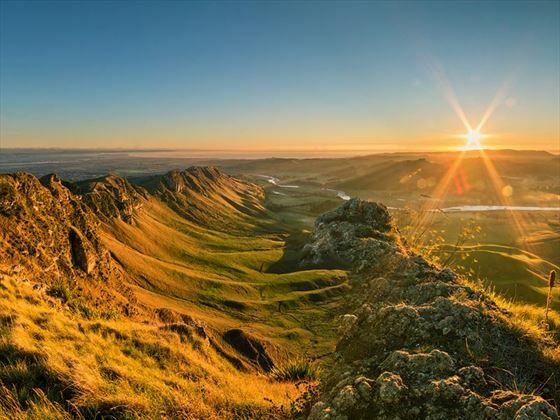 The rolling countryside of Hawke’s Bay leads you into some of New Zealand’s richest farmland, located around the Manawatu region. Masterson is home to the golden shears sheep shearing competition, whilst the further south town of Greytown boasts the largest concentration of historic wooden buildings in the country. The nearby Martinborough is home to dozens of boutique wineries, and the route will take you over the Rimutaka Range and along the magnificent natural harbour that the capital city of Wellington sits upon. The 92km journey between Wellington and Picton takes around 3 hours, and has been described as one of the most beautiful ferry rides in the world. Leaving Wellington Harbour, you’ll pass many interesting points such as Pencarrow Head (New Zealand’s oldest lighthouse), Red Rocks (home to a seal colony), and Oterangi Bay (home to the country’s highest ever wind speed of 167mph). From the Cook Strait, spectacular views of the Kaikoura Ranges on the South Island can be enjoyed, and dolphins and many sea birds can often be been. Around one hour of the cruise takes you through the remarkable Marlborough Sounds and stunning scenery of verdant mountain tops, small islands, crystalline waters and secluded bays. The final leg of your cruise continues through Queen Charlotte Sound before coming to an end in the picturesque town of Picton. From Picton, head south on State Highway One towards Blenheim and the wine-producing region of Marlborough; ideally located to enjoy an afternoon sampling the local produce, you’ll stop for a guided wine tour. Crossing the scenic hills of the Marlborough ranges, you’ll head towards one of the most spectacular coastlines of the South Island, the Kaikoura Coast – the road hugs the shore for around 50 kilometres, and offers many chances to view the native wildlife such as seabirds and New Zealand fur seals. 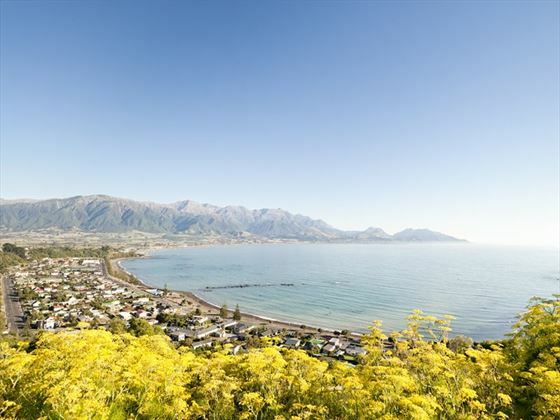 To the west, you’ll follow alongside the Kaikoura Ranges before arriving into the bustling Kaikoura Township; be sure to take a whale-watching boat trip and observe the fur seal colony basking in the sun at the tip of the peninsula. Today you will continue down the coast before heading inland through North Canterbury’s wine region, the Waipara Valley. As you drive through this breath-taking land, you’ll be greeted by one of New Zealand’s most notorious animals, the sheep. If you have time on your hands, we recommend taking a detour to Hanmer Springs for a relaxing dip in its thermal pools before arriving into the city of Christchurch. Nestled in the heart of the Canterbury Plains bordering the Pacific Ocean, New Zealand’s newest city is an ideal gateway to exploring the middle of the South Island. You could go punting on the Avon River, hop on one of the historic trams through the city, and perhaps catch a gondola to the rim of an extinct volcano. See the world’s only Cardboard Cathedral and wander through the famous Christchurch Botanic Gardens. Drive an hour in any direction to ski, mountain bike, wine taste, whale-watch, bungee jump or golf. 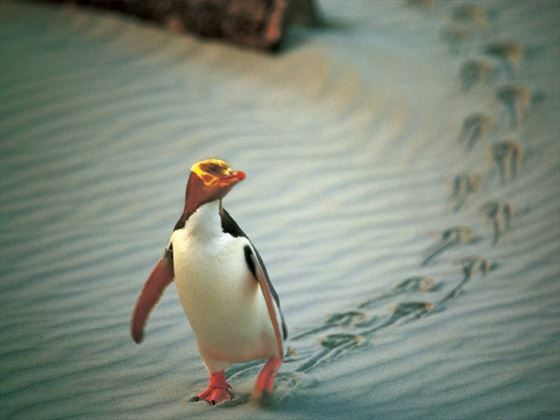 Visit the International Antarctic Centre or take a day to delight in a safari at the Orana Wildlife Park. Take the winding Port Hills roads to the French settlement of Akaroa, and tour the vines in Waipara for an authentic New Zealand wine-tasting experience. Today you’ll drive through the heart of the South Island, crossing the vast Canterbury Plains. Catch your breath in Geraldine before continuing through Fairlie, ascending Burke’s pass before reaching the picturesque lakeside town of Tekapo. Follow the road and take in the stunning vistas of Aoraki Mt Cook (New Zealand’s tallest mountain) from the shores of Lake Pukaki, known for its glacier-fed turquoise blue colour. Continue along the lake to your final destination, Mt Cook Village. * Please Note: There are no food outlets or shops at Mount Cook, so you will need to stock up prior to arrival here if you wish to self-cater. 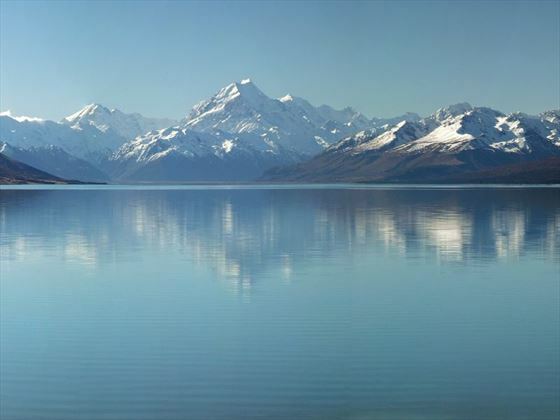 Today you’ll leave Mt Cook National Park and travel past Twizel, one of the filming location for The Lord of the Rings. Head through Omarama, the ‘gliding capital of New Zealand’, and be sure to stop at the Wrinkly Ram, a lovely local café which offers sheep shearing demonstrations. Drive through the Waitaki Valley, following the hydropower generating systems towards the east coast; take a break in Oamaru with the chance to see the blue penguins come ashore at dusk if you arrive a little later in the day. Continue south down the coast to Moeraki and take a detour towards the beach to see the unique Moeraki Boulders. As you arrive in Dunedin, take in the city’s Edwardian and Scottish heritage reflected in the buildings around the city centre – the Octagon. Known as the Edinburgh of the South, Dunedin features a heavy Scottish flare; surrounded by rugged coastal plains and windswept beaches, the city is home to an eclectic blend of historic and modern architecture, including the renowned ‘Gingerbread House’ Railway Station. Wander through the lovely Saturday farmers market for a taste of organic produce, local honey and handmade crepes; explore the many cafes and wine bars in the Octagon, and then continue for a self-guided walking tour of the internationally-acclaimed street art dotted around the city. If you’re looking to explore more of the history around the region, follow the coast to New Zealand’s only castle, Larnach Castle – be sure to head to the Otago Peninsula on your way back to see the largest mainland albatross breeding colony in the world. 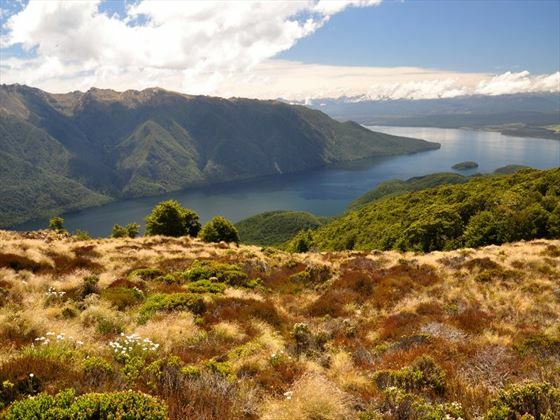 The scenic drive to Te Anau will guide you through spectacular Southland farming scenery; head off the beaten track and follow the coastline instead of the inland route. Go through the Catlins and take a detour to Kaka Point for views of its majestic cliffs and pounding surf, and continue through Invercargill to Riverton and Colac Bay. Drive north to Manapouri, where you can embark on a day or overnight cruise to the Doubtful Sound – renowned for its astonishing natural beauty. Just a short drive further will bring you to your lakeside destination of Te Anau, gateway to the Fiordland National Park and Milford Sound. 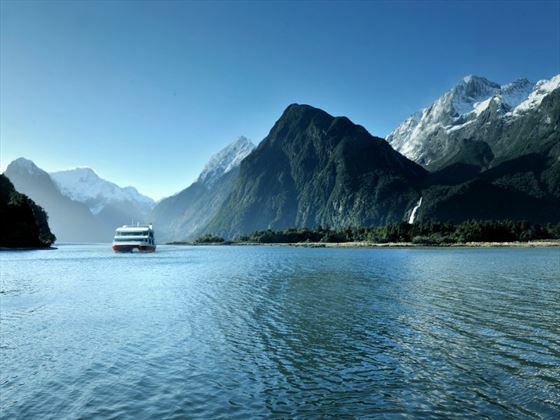 The journey to Milford Sound offers some of the most beautiful and iconic scenery in the country, from crystal-clear lakes and towering mountains to luscious, glacier-formed meadows. Stretch your legs on the Chasm Walk with a short stroll through the native beech forest to see a plethora of enchanting waterfalls, before continuing on through Homer Tunnel. 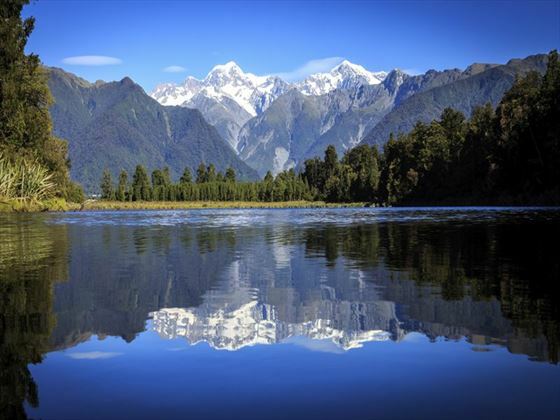 As you arrive in the village of Milford, you will be greeted with an amazing view of Mitre Peak. A day cruise into the heart of the sound is not to be missed – you’ll learn about how the magnificent area was formed, and experience the wonder of the falls that line with the Fiord. Return back to Te Anau the way you came in the evening. Today you’ll cross vast tussock lands on your way to Queenstown; pass through Mossburn, the deer capital of the nation, and continue on through the South Island countryside, where the road begins to frame the lake edge and the incredible Remarkables Mountain Range towers over your approach into New Zealand’s adventure capital. Although celebrated as New Zealand’s adventure capital, Queenstown offers incredible natural beauty. 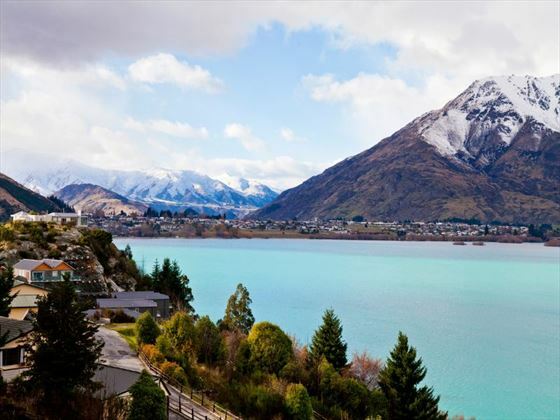 Settled on the shores of Lake Wakatipu beneath a soaring panorama of the Remarkables Mountain Range, this alpine town offers a plethora of historic, gastronomic and scenic wonders. Head down the Gibbston Valley wine trail to sample some of the region’s finest Pinot, or enjoy a scenic ride on the TSS Earnslaw, a 100 year old steamship, to Walter Peak Station for dinner and a farm tour. Browse the waterfront cafes and have lunch at Michelin Star Chef John Emett’s ‘Rata’. Ride the gondola for breath-taking views, or venture further afield to the Fiordland National Park or over the Crown Range to Wanaka. Drive through Lord of the Rings Country and enjoy a dedicated tour, and after all that, if you want the adrenaline rush Queenstown is renowned for, take your pick from the Shotover Jet, Nevis Bungy, Canyon Swing, Luge or Heli-Ski. From Queenstown, you will cross the Crown Range – the highest sealed road in New Zealand – to arrive in the alpine town of Wanaka, gateway to Mt Aspiring National Park. Skirting the shores of both Lake Wanaka and Hawea, you will enter the small town of Makarora. 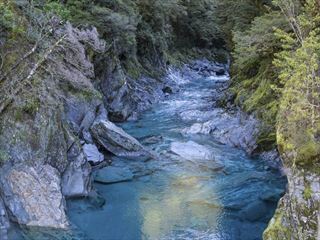 Stop at the Blue Pools for a ten-minute walk through the native beech forest to a glacier-fed swimming hole. Continue on through the remote seaside settlement of Haast before heading up the West Coast – a 600km stretch of bush and native rainforest. Fox Glacier welcomes you first, and then your destination for the night, Franz Josef Township. Franz Josef is a small but vibrant town in the heart of the West Coast, known for its 12km-long glacier. You may see the magnificent ice up-close with a walk along the valley floor to the terminal face without a guide, but if you’d like to get within 100 metres or walk on the glacier itself, you’ll need to take a licensed guided tour – you can trek the glacier with specialist equipment and a guide, or you could book a helicopter landing for an easier experience. Once on top, you’ll have the chance to explore ice flows, crevasses and caves. Today, you’ll head north through the historic gold mining region of Hokitika; head to the coast and soak up the endless sea views, or pick up a souvenir at one of the many craft shops. Continue on to Greymouth – the largest town on the West Coast and starting point for the next leg of your adventure – the TranzAlpine Scenic Train to Christchurch, considered one of the world’s greatest train journeys. On arrival in Christchurch, you will be met by a private transfer driver and taken to your hotel for the night. After breakfast, you will be collected from your hotel via private transfer and taken to Christchurch Airport in time for your departing flight. 20 nights of accommodation in charming, boutique hotels and lodges.